Researchers from the Rensselaer Polytechnic Institute have developed a new graphene based anode that can be charged or discharged 10 times faster than conventional graphite anodes currently used in today’s lithium-ion batteries. To create the new anode material, the researchers took a sheet of graphene-oxide paper and then introduced defects (using a laser or a camera flash) on the material. 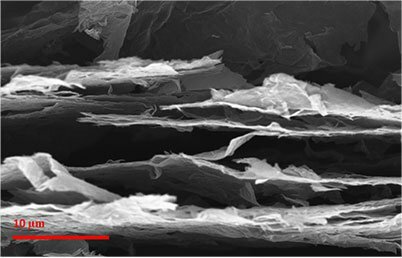 The graphene paper, after being damaged, has expanded five-fold in thickness, which means that there were large voids between the graphene sheets. The lithium ions can use the cracks in the paper to quickly traverse the entire sheet - which means faster charges or discharges of the battery. The researchers say that this discovery is ready for commercialization, and have filed a patent for this discovery. The next step in their project is to pair the new anode with a high-power cathode and create a full battery.